Chris Young has been racing forever. “Or it seems like it sometimes,” he says. “It’s well over 30 years. I still race a bit, and I still work in cycling as one of BC’s Go Ride coaches. I suppose I ought to come out of my comfort bubble and try something else, but I enjoy it. Cycling is a community full of all sorts of people. Plus they come from all walks of life, which means you’re never stuck for a plumber,” he adds with a smile. Young reckons he’s ridden today’s route for as long as he’s been cycling, and it reflects his racing past. He found his feet as a teenage cyclo-cross racer, became good enough on the road to turn pro, and with both skills in place he was a hot ticket when the mountain bike boom hit Britain. “The Nineties really were good for pro racing. We had televised city centre racing, televised mountain bike races, and the Tour of Britain, and I did them all. My sponsors got their pound of flesh from me but I enjoyed it,” he says. Young is joined today by his son Paul, who is showing the same sort of all-round promise. He was introduced to this ride by his dad and now does it as part of his training. “The route’s a bit of trails, some loose surfaces and some roads. It’s got flat bits, climbs and descents, and you can do it on a cross or a mountain bike. It’s like a little history book for me, because it goes past my parent’s house and links together the different places where I trained,” Young explains at our first rendez-vous for photographs. It’s at the Leeds-Liverpool canal towpath in Bingley, right by the famous five locks and close to Damart Mill, where Young worked before he turned pro. “I was 24 and beginning to think it wouldn’t happen, but then I got a contract with Ever Ready-Halfords and I was a full-time pro for the next 12 years,” he says. Training after work and even sometimes during lunchtimes is what launched Young’s pro career. He looks for the same application in the riders he coaches today. “Determination is the key in cycling, more than talent. You’ve got to try hard all the time. I’ve seen it so many times. You get someone who trains hard, is dedicated and pushes, then eventually something clicks and you’ve got a good bike racer. “My advice to anyone is don’t let your first results put you off, just keep at it. Of course if you haven’t done it by the time you are 25 then you have to say it’s not going to happen, and sort yourself out with a career. You can still enjoy cycling. “After I stopped as a pro I said I’d race until I was 40, but I’m still doing it six years later. I look at 60-year-old racers and see how happy and fit they look and wonder if I’ll be doing the same as them. I hope so,” he says. After threading through the streets of Saltaire, Young points out his father’s house and flicks up over the pavement into the nearby woods. “This is where I practised my cross skills when I lived at home. There are lots of tracks through the woods, roots, soft and rough surfaces, and run-ups. The whole area is on a big hill. Sometimes I used to run from the bottom to the top as well. I don’t run at all now because you don’t have to in modern cross races,” Young says. I pick up a touch of regret: does Young think today’s cross courses are too easy? “Not easy. They made the courses here like they are in Belgium so that there are big groups racing, but they missed a point. 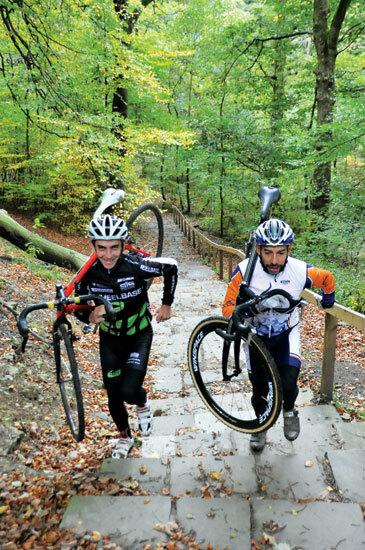 Belgian cross races are the hardest in the world, but it’s because of the depth of talent over there, not the courses. We haven’t got that depth, so tough courses made our races hard, and that worked better for British cross racers. You look back, if the Worlds were tough then the British riders always did better than they normally did,” he explains. Off-road bikes still feature in Young’s day job. “Mountain bikes are the best way to get kids racing because they love bombing down hills on them,” explains a man who has a big mtb history. In the late Eighties and early Nineties mountain bikes revitalised the UK bike industry. Young was a rider manufacturers wanted on their bikes. Tough races were a test for tough bikes, even if the equipment was still fairly rudimentary. “We had no suspension and the organisers went out of their way to find the roughest courses. By the end of some races you could hardly use your hands. Mountain bike races mess up your legs for a few days afterwards, but we still had midweek crits to do, and a road race or two on weekends between the mountain biking,” Young remembers. Young, Tim Gould and David Baker were the heads of a pack of pros who did the full spectrum of racing, but who was best and why? “Tim Gould was the best, and why is simple. Tim could go uphill faster than anyone, and he went downhill faster than anyone too. You can’t beat that,” is Young’s judgement. The best bit of this ride, or worst depending on how you look at it, is the last section. 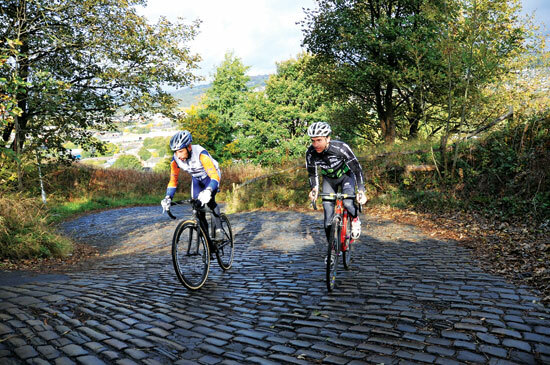 The cobbled climbs of Belgium are legendary, but they’ve got a rival in Thwaites Brow. It would be a great addition the Tour of Britain. Young’s ride goes down it, but of course I have to ask Chris and Paul to ride back up. The climb is 1,000 metres long, averages 12.6 per cent, but the first part is more like 25, and it’s covered with cobbles; wicked, laughing, slippery cobbles. The Youngs tip-toe down using the cambers to help get them around the hairpins, then lunge their way back up past me. The least I can do is get the picture right, because I can’t ask them to do it again, can I? “No,” they both say together. “There, I reckon that if you really batter it you can get round that in just over an hour and it will have done you the world of good,” Young says after clattering down the cobbles and sprinting the last few hundred metres to his back door. “That’s why I like cyclo-cross. It’s really accessible, it only takes an hour to do, so you can get away with just a few training rides like this one each week, and you’ve got out of the house, raced and had a good natter after it. I’d recommend cyclo-cross to anyone,” he adds. Start at the first roundabout on the A650 east of the A629 junction just outside Keighley. Head east on the B6265 to Crossflatts, where you turn left onto the Leeds-Liverpool canal towpath to Salt’s Mill in Saltaire. Turn right over bridge and head south, then turn left onto the A657 and take the first exit at junction with A650. Go straight up the hill and take the left turn before a sharp right bend. Turn right onto A650 and take the fifth right into parkland. Follow the path uphill, obeying any ‘no cycling’ signs. Turn left at the road and follow path through the golf course. Join the road again and go down and uphill then turn right. Turn right onto B6269. Turn left and right to Bank Top and descend the off-road section called Sandy Balls. Turn right onto the road and right into parkland just after Harden. Follow the bridleway taking left turns back to the road. Turn right onto the road. Turn right just as you enter the built-up area and descend Thwaites Brow. Continue to the A650 and turn left to finish. This particular part of the region has big bike racing history. Sid Barras lives just a few miles from Keighley; Keith Lambert too. They were head honchos of a posse of talent that stretched from the Seventies to the present. Dave Rayner lived near here as well. Together with Dudley Hayton, Dave Mann and Young they made a training group that was as tough to live with as any in the country. Riders like Paul Young and Tom Moses are running with the Barras/Lambert baton today. The Yorkshire Dales are almost on Keighley’s doorstep, and the Brontë country of Haworth definitely is. Both are great places to ride. The main access roads are busy, but studying a map reveals a number of alternative routes in. 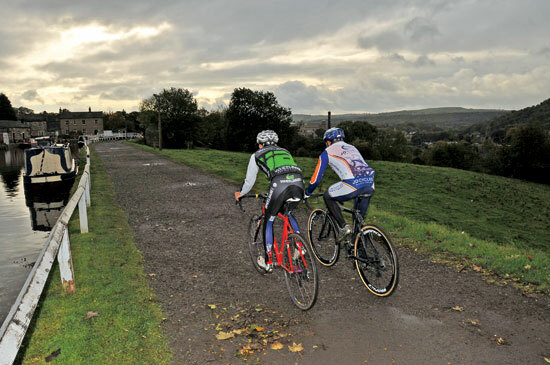 The Aire Valley towpath, part of which features in Young’s ride, is a great place to ride, especially for families. See www.airevalleytowpath.org for details. The Pennine Way bridleway is also close to Keighley, and Sustrans is working on a new route in this area called the Great Yorkshire Trail.